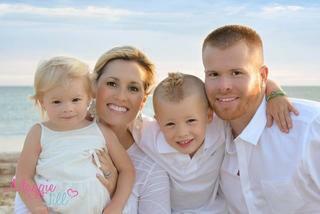 Erica Adams, the owner of New England Total Basement Finishing, with family. New England Total Basement Finishing has been in business, and a part of Total Basement Finishing, for 10 years. Being an authorized dealer means that we use all of their tested, industry-changing products. Our employees are backed by a network of basement finishing experts and have been trained in both products and customer service. You will notice the difference between a Total Basement Finishing dealer and the average home contractor the moment you give us a call. New England Total Basement Finishing is proud to offer the cutting edge products of Total Basement Finishing to help our clients create the living space of their choice. All of our products are water and mold resistant so that having a damp basement isn't even a factor. Our products are also environmentally friendly, energy efficient, and durable. You can rest easy knowing your finished basement is built to last. Our installation team is made up of highly trained professionals that are fully versed in all of our products. You can expect an accurate estimate that will include all the details you're looking for in a finished basement. When the installation is completed in a timely manner, you will be fully satisfied with the end results. If you're looking for an office, living room, or a bedroom, our team will meet all your expectations.